Derek Newton is back with the Saints. 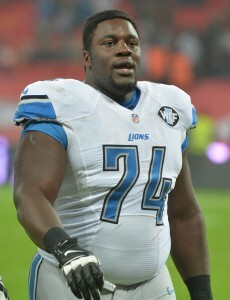 On Thursday, the Saints re-signed the offensive tackle, along with fellow OT Cornelius Lucas. To make room, the club cut defensive back Josh Robinson and defensive lineman Mitchell Loewen. The Saints signed Newton to a two-year deal in early December, even though he had not played since October 2016, then released him a few weeks later. The Saints needed healthy bodies up front due to a recent rash of injuries last week, but they’re now able to accommodate him on the roster. A 2011 seventh-round pick out of Arkansas State, Newton was the Texans’ starting right tackle from 2012’s first game until that career-altering night in Denver when Newton shredded both of his knees. The Texans waived Newton via failed physical designation in April, and he filed a $500K grievance. This year, Newton worked out for the Jets, Cardinals, and Saints and showed enough in New Orleans to warrant an opportunity. The Saints kept Newton on speed dial, and he now has a chance to contribute to a contender. Derek Newton‘s comeback hit another unfortunate roadblock on Thursday. The offensive tackle was released by the Saints after he was unable to come back from two torn patellar tendons. The Saints signed Newton to a two-year deal earlier this month, even though he has not played since October 2016. The Saints were initially willing to stay patient with the veteran, but they desperately need bodies up front due to a recent rash of injuries. To give some instant relief, the club signed Cornelius Lucas in Newton’s stead. A 2011 seventh-round pick out of Arkansas State, Newton was the Texans’ starting right tackle from 2012’s first game until that career-altering night in Denver when Newton shredded both of his knees. The Texans waived Newton via failed physical designation in April, and he field a $500K grievance. This year, Newton worked out for the Jets, Cardinals, and Saints and showed enough in New Orleans to warrant a contract. The Saints will likely keep Newton on speed dial, but another team could scoop him up before they get the chance to bring him back. Although Matt Eberflus was tied to Josh McDaniels when he accepted the offer to become the Colts‘ defensive coordinator, Stephen Holder of The Athletic notes (subscription required) Chris Ballard was the driving force behind the then-Cowboys linebackers coach moving to Indianapolis. The second-year Colts GM held Ebeflus in such high regard that he may have been the DC choice without McDaniels’ involvement, though likely not had the Colts hired a defensively geared coach. But in nearly all of the interviews the Colts conducted, Holder reports Eberflus’ name was broached. Despite a host of young players for a unit not expected to be particularly strong, the first-year DC has the Colts holding the No. 11 DVOA defense going into Week 15. The 2017 Colts produced the No. 27 DVOA defense. The latest from some South teams, continuing to Tampa. It is possible DeSean Jackson has played his final game with the Buccaneers. Playing on a contract that includes no additional guaranteed money, the 32-year-old wide receiver had his injured thumb immobilized, Greg Auman of The Athletic tweets. Jackson has been unable to grip footballs with his injured hand, forcing him to miss the past two Bucs games. He had previously played through this malady, per Auman (on Twitter). Tampa Bay’s top deep threat hopes to play again this season, but that’s not a lock. And with a nonguaranteed $10MM base salary on the Bucs’ books next year, Jackson is a prime release candidate in 2019. Most believe Buccaneers GM Jason Licht has a better chance of returning in 2019 than Dirk Koetter does, Jenna Laine of ESPN.com writes. Despite the Bucs still staring at what will likely soon become an 11-season playoff drought, Licht’s ability to draft and extend the likes of Mike Evans and Cameron Brate has pleased ownership, Laine adds. Licht signed an extension that takes him through the 2019 season, but it remains possible the Glazers move on from he, Koetter and Jameis Winston and start fresh next year. Arthur Blank said he has not lost faith in Thomas Dimitroff or Dan Quinn, but the Falcons have since endured another one-sided defeat and now sit 4-9. They already made other moves, like replacing highly paid right tackle Ryan Schraeder with Ty Sambrailo, for the future. Mike Florio of Pro Football Talk writes more losses will continue to cause suspicion as to whether Blank will change his mind and pivot to a new power structure. Derek Newton‘s Saints contract is a two-year pact, according to his agency (Twitter link). It appears the Saints will use their upcoming practices to gauge whether the former longtime Texans right tackle is fit enough to the point he could be more than an injury fill-in. Michael Ola‘s ankle injury will result in the Saints sending the offensive lineman to IR, and it represents an interesting chapter in a long comeback story. The Saints, per Nick Underhill of The Advocate (on Twitter), will fill Ola’s roster spot with free agent tackle Derek Newton, who has not played football since October 2016. While Newton’s career was thought to be over, the formerly dependable Texans tackle has participated in workouts during the 2018 season — most recently with the Saints. That audition will land the 31-year-old blocker a job with the 11-2 Saints. Ola went down with a high ankle sprain during the Saints’ win over the Buccaneers, according to NOLA.com’s Josh Katzenstein (on Twitter). A journeyman who has started one game in the past three seasons, that coming this year for the Saints, Ola will end the year on IR. He has not played for the same team in consecutive seasons since coming into the league, spending time with the Bears, Lions, Chargers, Bills and Saints. 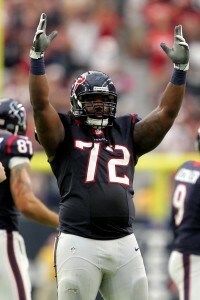 A 2011 seventh-round pick out of Arkansas State, Newton was the Texans’ starting right tackle from 2012’s first game until that career-defining night in Denver. Newton tore both of his patella tendons in that game. The Texans waived Newton via failed physical designation in April, and he field a $500K grievance. But Newton then worked out for the Jets, Cardinals and Saints in the fall. He may soon have a chance to suit up in a game again. If Newton suits up for the Saints, he will be the first player in NFL history to dress for a game after suffering two patella tendon tears. Former Bears wide receiver Wendell Davis and former Ravens and Browns cornerback Gary Baxter returned to practice but never again suited up for a game after suffering these severe injuries, per NFL.com’s Mike Garafolo (on Twitter). Two years after suffering one of the most career-altering injuries to ever affect an NFL player, Derek Newton has not given up on returning to the league. And the Jets gave the former Texans right tackle a chance on Tuesday. The Jets worked out Newton today, USA Today’s Mark Jones reports (on Twitter), adding the former Houston starter looked good during the audition. No deal is imminent. Nevertheless, Newton being in this position is an accomplishment considering he suffered multiple patella tendon tears during an October 2016 game in Denver. He’s attempting to become the first player to suffer bi-lateral patella injuries and return to the NFL, Jones notes. The Texans released Newton in April. He has a $500K grievance pending against his former employer. Newton will turn 31 next month. He was a five-year starter for the Texans, who have not found a suitable replacement for him yet. Newton signed a five-year deal to stay with the Texans in 2015, but the severe knee injuries a year and a half later sidetracked both parties’ plans. The Bengals surprised many with their release of safety George Iloka, but it has been in discussion ever since the drafting of Jessie Bates III in the second round, according to Kat Terrell of ESPN.com (Twitter links). Despite Iloka’s past performance, the Bengals are ready to move ahead with the rookie and give him the playing time he needs to develop. The Bengals were also wary of using a roster spot on a veteran who doesn’t fit on special teams. Iloka wasn’t a fit for the 2018 Bengals, but there are plenty of other teams who are interested in his services. He’s already on the radar of the Raiders and Cowboys, and it stands to reason that other teams will get on the horn with him in the coming days. It was widely reported that Jon Gruden‘s deal with the Raiders will pay him a guaranteed $100MM over ten years, but Gruden says that’s not true (via Mike Florio of PFT). The truth may be somewhere in between. It’s believed that Gruden’s $100MM is not fully guaranteed, Florio hears. The structure of the contract is believed to be more along the lines of $25MM over the first five years, and $75MM over the final five years. If that’s the setup of the deal, then it’s possible that the final five years are not fully guaranteed or even largely guaranteed. Former Texans offensive tackle Derek Newton filed a grievance seeking payment of a $500K roster bonus, according Aaron Wilson of the Houston Chronicle. Newton was officially released in April 12 with a failed physical designation, but his roster bonus was due April 1. The Texans held Newton on the roster past the bonus date, but he didn’t pass the physical. Therefore, Newton is seeking $200K from the team. For now, that number is held against the Texans’ cap. We recently heard that the Patriots were just one of two teams to rate Baker Mayfield as the best quarterback in this year’s draft, and Mayfield’s agent, Jack Mills, indicated that New England may have been willing to move up to the No. 2 overall pick to land his client. However, Mike Reiss of ESPN.com is not so sure. He thinks the Patriots wanted to meet with Mayfield as part of their thorough scouting process, but if they did not sell Mills on the potential that they could make a big move up, Mills would not have wasted Mayfield’s time with a New England visit. Reiss does not believe the Pats would have jumped from No. 23 to No. 2 even if Mayfield was still on the board. The Patriots have not officially announced their 2018 crop of UDFAs, but as Reiss observes, they have signed Vanderbilt running back Ralph Webb and gave him a $70K guarantee, which clearly makes him a priority signing with a decent chance of making the final roster. In a separate piece, Reiss says that Mike Gillislee, who opened the 2017 campaign as New England’s No. 1 back, is now fighting for a roster spot. With new first-round pick Sony Michel and veterans Rex Burkhead and James White considered locks, Gillislee will battle Webb, Jeremy Hill, and Brandon Bolden for one or two spots. The former Bill could be cut with no dead money ramifications. When he was recently asked if he felt appreciated by Bill Belichick and Robert Kraft, Tom Brady replied with a joke/non-answer. It is unclear whether Brady actually feels underappreciated by the other two most important figures within the organization, but Mike Florio of Pro Football Talk believes the club should ante up and pay Brady a salary more in line with the top of the market. Brady’s $20.5MM AAV is now 16th among all quarterbacks, and Florio believes the Pats should rectify that to some degree. The news continues to be good for 2017 third-rounder Derek Rivers. Reiss says Rivers, who tore his ACL last August and missed his entire rookie campaign, is expected to be ready for the start of training camp. Earlier this week, ESPN’s Mel Kiper named Patriots’ sixth-round WR Braxton Berrios as one of the 2018 late-round selections most likely to make an immediate impact.